There is nothing worse than being on the open trail miles from home when the unexpected happens. 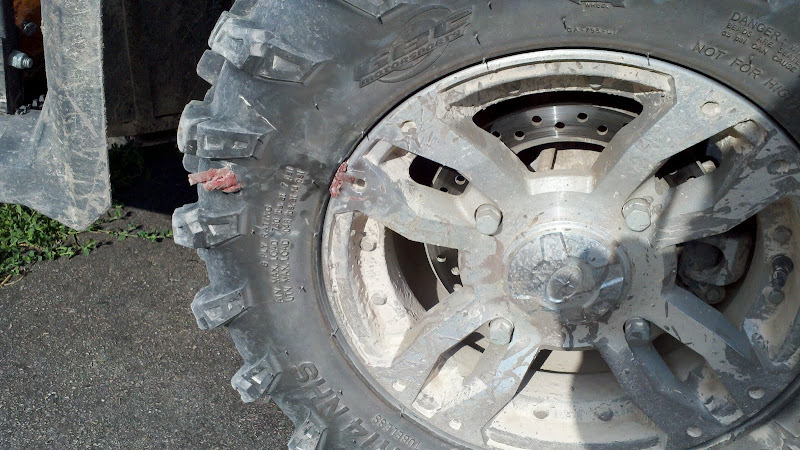 A piece of metal punching through you 8 ply tire and then through your rim! This happened to me on a ATV trip in the Black Hills of SD 30 + miles from the camp site. Looking at the damage and size of holes I thought that I was done for the day. To my surprise my handy DELUXE TIRE REPAIR KIT WITH ULTRAFLATE PLUS CO2 INFLATER did the job. It took several plugs to patch the tire. After the plugs were in place I used the CO2 to inflate the tire. I then found the puncture in the rim. It took 2 more patches to patch the wheel. It took 2 CO2 cartridges to full the 26/11/14 tire to around 6 psi and I was off again. This kit saved the day for me! I made it back safe to the camp site 30 miles away. The next morning the tire was still holding air! This kit is a MUST for anyone who owns a ATV. May it be riding around the home or on the trail. This kit has been tested by me in the field and is TheATVSuperStore tested and approved! Any questions on this or the other products we sell feel free to call the shop and ask for Thor! Remember we test & use what we sell and only sell the best! P.S. I now also carry our compressor kit. Better to be extra safe than sorry!! !